Total Basement Finishing of Connecticut is the authorized finishing dealer servicing the entire state of Connecticut, southern Massachusetts and Westchester County, New York. Total Basement Finishing offers a state-of-the-art basement finishing system in Connecticut southern MA and Westchester County. This basement finishing system has been specifically designed for the basement environment. It is waterproof, and mold and mildew resistant. Total Basement Finishing offers a free in home estimate with a highly trained basement Design Specialist that will be committed to working with you in designing the basement of your dreams. Total Basement Finishing of Connecticut services Fairfield County, New Haven County, Hartford County, Litchfield County, Tolland County, Middlesex County, New London County, Windham County, Westchester County, New York, Hampden and Berkshire counties in MA. 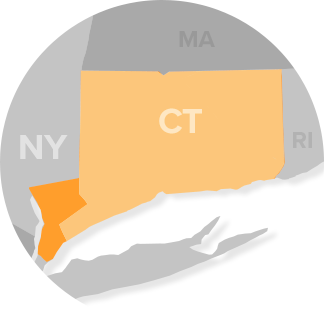 View our service area page for a complete listing of Connecticut, Massachusetts and New York towns.